Every day, business owners are faced with potential attacks on their network, such as spyware, malware, and hacker intrusions. At LUZ Technologies, we won’t let you go unprotected. We mitigate risks and reduce your system vulnerabilities by conducting a cybersecurity assessment and strengthening your network’s weak points. It is our goal to find the best network security solutions your business needs in order to boost your productivity. Outsourcing is here to brighten your outlook on IT. 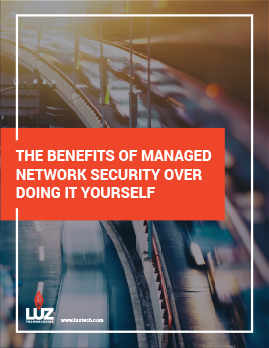 For a detailed look on how Managed Network Security can change your business, download our solution brief here. Reduces the risk that your company will not meet business continuity, privacy and disaster recovery compliance standards. Increases network performance by eliminating shut-downs and slow-downs and assuring networks deliver services at peak levels. Reduces the stress that comes with the oversight and maintenance of intricate security systems that need to grow along with your company. Lowers the overhead connected with hiring and constantly re-training and certifying specialized IT staff. Outsource your IT to a team of experts. More peace of mind. Less overhead. Outsourcing is here to brighten your outlook on IT. Interested in learning more?